My Kitchen Musings – “Just write about it!” Thoughts, resources, where to find authentic ingredients, how-to. No recipes here. Just recommended resources and writing about the perfect piece of cookware or kitchen appliance, a unique source for a favorite ingredient, traditional table settings, favorite cookbooks or where to locate the elusive replacement part for “vintage” kitchen gadgets. It’s all here. You know – when you just have to write it down. These articles feature all types of cooking related information! Years ago, I was jokingly told to write about it. 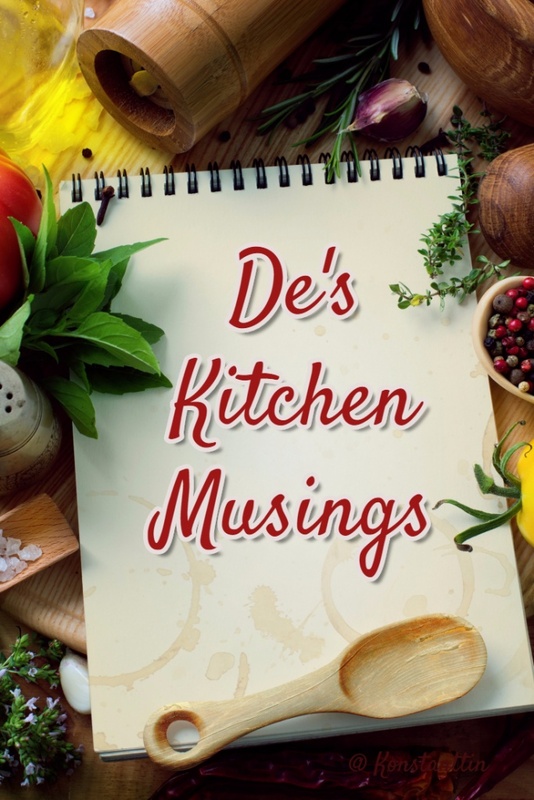 “Why don’t you combine the travel, the adventures and the food we eat every day into a favorite family recipes blog ?” De’s Home Style Food Crafting gives me a platform to write about all those musings! De’s Home Style Food Crafting is all about documenting our family culinary adventures. I write about the family chefs, their signature recipes, scarce and elusive ingredients, favorite kitchen gadgets, vintage or new appliances of all kinds and how to prepare certain dishes. You will also find articles about how we set our Holiday tables. Table settings and decorative tablescapes are very subjective but this is how we do it. For Thanksgiving, tradition lives on in the table settings as well as in the recipes. Great-grandma’s five piece place settings, a great uncle’s favorite wine glasses, Grandma’s large oval platter for the turkey combined with my favorite Woodland Turkey® tableware. Tradition continues when setting the table for a milestone birthdays, Easter brunch, a right proper Christmas dinner (back to ye olde English roots) and a très French Réveillon! We spend hours around the table eating, recollecting and catching up on everything from the finer points of winning volleyball games to the latest aches and pains. Might as well set a beautiful tablescape with a collection of your favorite things. 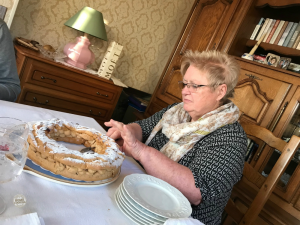 Francine cuts the first slice of the Paris-Brest! During a recent milestone birthday trip to the family homestead my sister and I were wined and dined like long lost family. We are certainly not lost because we are in constant touch but a few years have flown by. Every hour of the day was spent reminiscing about time. Dinner with the cousins lasted close to five hours. Dinner with a neighbor lasted four hours and that celebration dinner lasted 7 hours. Yes, seven hours. How can six of us sit there, eat and talk for that amount of time? With the greatest of ease. Start with one bottle of champagne and then four bottles of wine. A five course meal. My sister and I represented the family but everyone seated at the table played and continues to play a role in our story. The menu? Pierrette assembled the quintessential French country menu with all my childhood favorites – from the Apéritif to the homemade Paris-Brest. What can I say – it’s super when family friends include the town Boulangère. Now retired, Francine and her husband Serge spent 36 years baking and selling the best pain et patisseries (bread and pastries) for miles around . 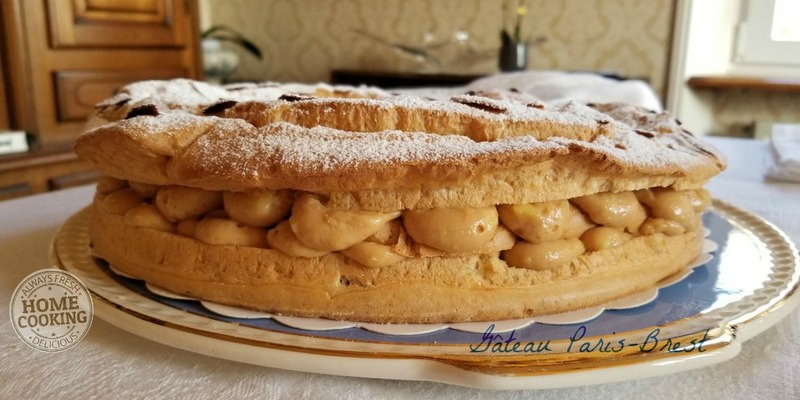 Serge baked this impressive Paris-Brest! From the beginning of the meal to the last bite of cake the champagne and wine were flowing and the memories were as sharp as ever. 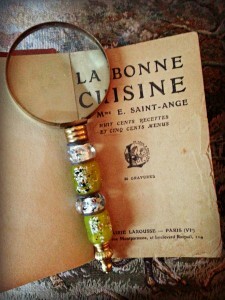 Kitchen musings and related articles develop as I document our favorite family recipes. When I transcribe all those recipes into blog posts, memories and anecdotes are included to give them background. 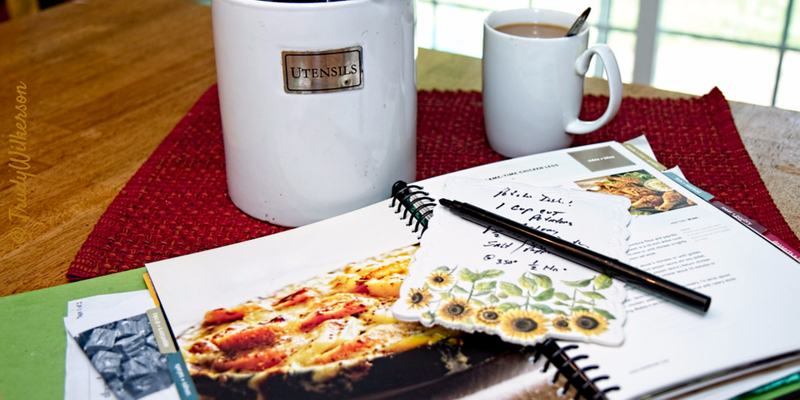 De’s Home Style Food Crafting is written for family members, friends and fellow foodies. Listed below is a growing list of resources, tips and gift ideas to go along with my varied kitchen musings. It’s one thing to have the ingredients, the method and the directions memorized for Mom or Grandma’s recipe but it becomes a totally different thing when comes time to illustrate preparation, cooking process and accurately describe the steps to preparing a vintage family recipe. Do you treasure favorite family recipes? Document everything about them. Don’t hesitate to write it all down. Kitchen musings – Un peu de çi, un peu de ça! Many of my recipes are slightly adapted because (years ago when we lived across the globe) the original ingredients were not available locally. 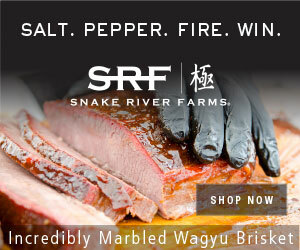 Every effort is made to come as close as possible to the authentic flavors we can still taste when we close our eyes. But… part of my kitchen musings is an effort to find authentic ingredients and writing up a list of resources. Family members still measure the flavor quotient of Minestrone to the warming bowl of soup we ate in Trieste one night back in the late 50’s. We had just driven more than 500 kilometres from Beograd. It was midnight and we were positive dinner, at such a late hour, was just wishful thinking. It seemed not a restaurant was open. Luckily, a waterfront ristorante was still open and willing to serve us as the only customers! I can still picture it and taste it. The best soup ever! Beyond the Minestrone, our quest is to share the recipes we prepared over the years and make sure that they all taste as authentic as possible or better yet – just the way Grandma made it! Of course, I’ll also continue to add to my #KitchenMusings articles any time I have a recommendation and/or a tip. Fresh or Frozen Turkey for Thanksgiving?